Mapping Collaboration - Who's Here? Who's Not. 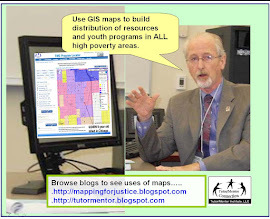 On this blog I show many examples of how maps can be used to show areas where people need extra help, based on indicators like poverty, segregation, wealth inequalities, violence, poorly performing schools, etc. I also demonstrate how data on existing youth programs can be collected and plotted on maps, in an on-going effort to help programs get the talent, dollars and ideas each needs to constantly improve and become the best they can be. In the map below I show participation in the 2017 Connected Learning on-line community, which you can find on Google+, Twitter, Facebook and other platforms. 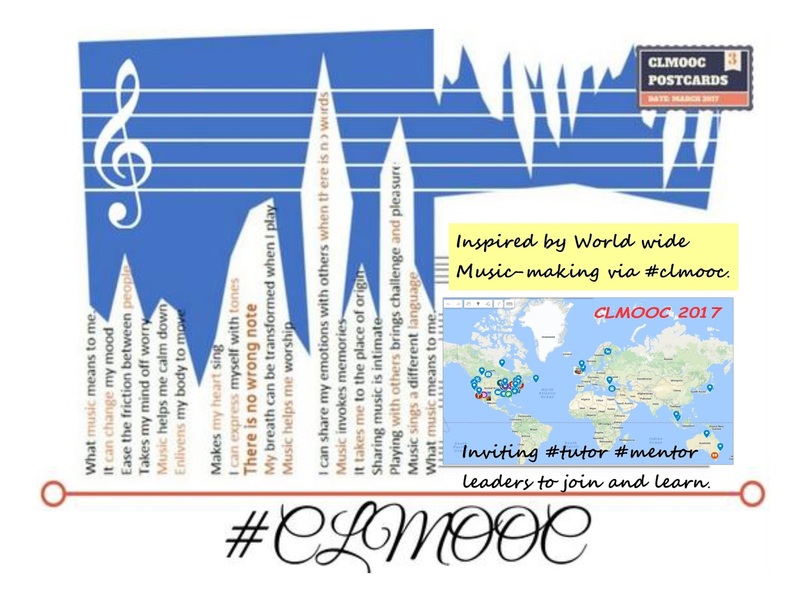 If you look at the on-line spaces where #clmooc participants are connecting you'll see a wide range of interaction around ideas and around "making things" like music, postcards, coloring books, etc. I'm interested in this because I've been trying to connect people who are involved in helping youth in high poverty areas get comprehensive support systems that help them from first grade all the way to first jobs, over a 20+ year period of support. While I've attended Chicago conferences hosted by big foundations, universities and/or businesses, with as many as 500 or more people in the room, I don't feel that these really are interactive, where people in attendance are connecting deeply with speakers and other participants the way people in the #clmooc are doing. 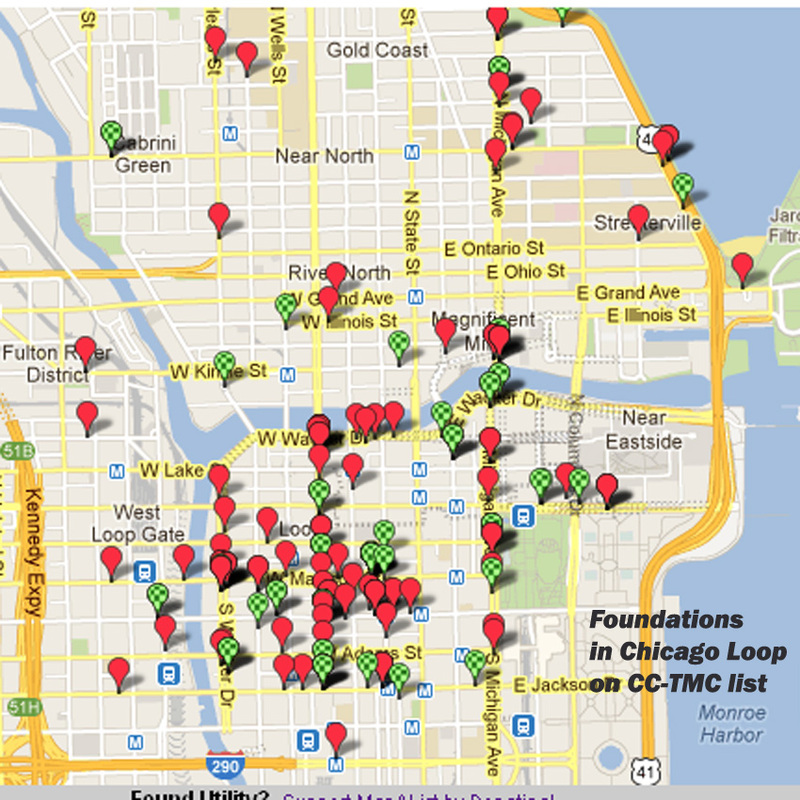 I've found very few building participation maps as part of their on-going strategies. Thus, I share the map and the idea in stories on this blog, and on the Tutor/Mentor blog. I can't make this type of engagement happen through my own limited efforts. 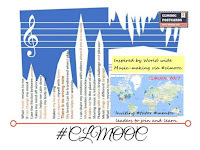 However, by shining the spotlight on the #clmooc group and sharing this attention on social media, I can try to inspire and influence others to help make this happen. I hosted Tutor/Mentor Leadership and Networking Conferences in Chicago from May 1994 to May 2015 and created some maps to show participation. I've also created concept maps, to show the range of talent and networks I was trying to attract to the conferences, and to help me help tutor/mentor programs grow throughout the region. You can see from viewing my maps that too few people from business, philanthropy, media, politics, universities and faith groups were attending the conferences I was hosting. 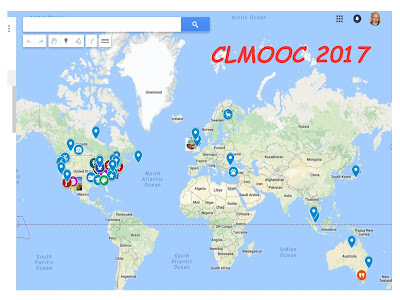 You can also see, from viewing the #clmooc participation maps from the past three years, that too few people from Chicago or other urban areas are participating in their efforts. 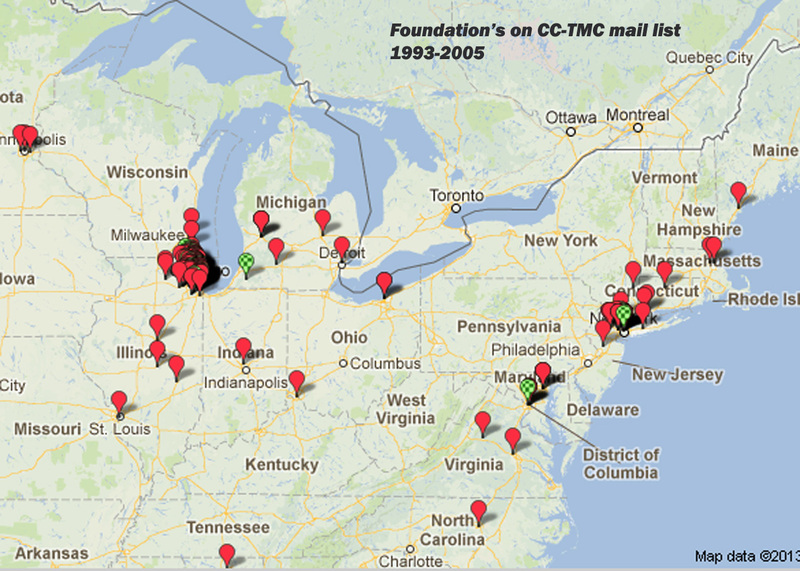 You can change that by visiting the #clmooc site, joining the group, and adding your name to the map. While participation ( or non-participation) in the Tutor/Mentor Conferences could be the topic of many discussions, my goal with this article is to encourage others to think about mapping participation in events they host (on-line and face-2-face) to show "who needs to be involved and interacting with each other" and "who is already involved"
Duplicate the #clmooc. Look at the image shown in this Tweet. Imagine many people from throughout the Chicago region, and the world, interacting and sharing ideas about who needs to be involved in on-going efforts intended to build and sustain needed youth and family service and jobs programs in every high poverty neighborhood of Chicago or other parts of the country, or the world. Interested in helping? This could be an on-going project hosted by a college group, or even a high school service learning course. Tweet me @tutormentorteam or post a comment to this article if you're interested in exploring this idea. WBEZ91.5 Chicago is doing some of the best research and mapping that I see in the Chicago region so I encourage you to visit their web site, Facebook page and other links and find ways to use these tools in your own communications. Here's map/article that shows home prices in metro areas around the US. 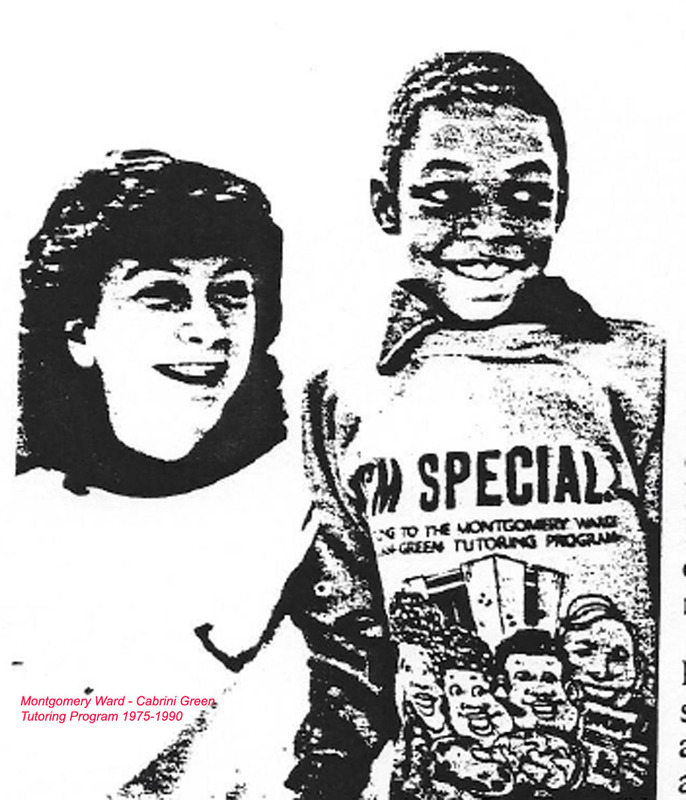 Why I Created Tutor/Mentor Connection in 1993. Why I Still Lead it. 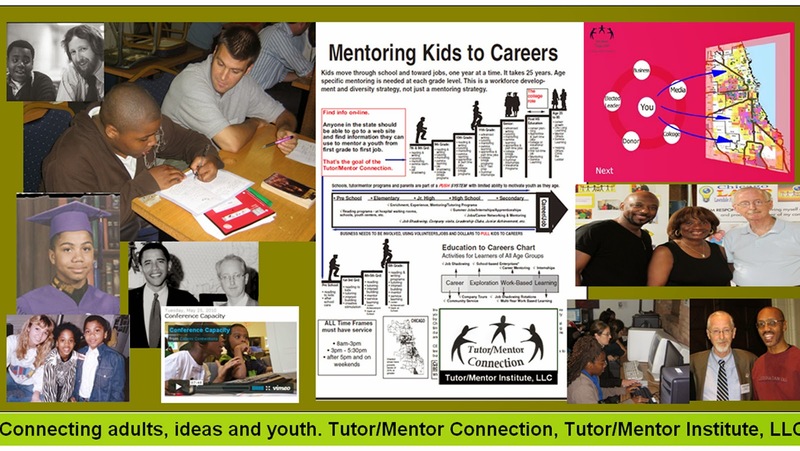 I started leading a volunteer-based tutor/mentor program in Chicago in 1975 while holding a full time retail advertising job at the Montgomery Ward corporate headquarters in Chicago. I used many of my advertising skills to support a volunteer based that grew from 100 to 300 between 1975 and 1992, then to support fund raising in the years since then. Over the years I saw many media stories talking about violence in Chicago, and editorials saying "we need to do something" but no strategies similar to how the corporate office supports hundreds of stores located all over the country. In late 1992 while forming a new non profit to serve 7th-to-12th grade kids who were aging out of the original program, I and the six other volunteers who were helping me, decided to fill the leadership void that I'd seen over the previous 17 years. 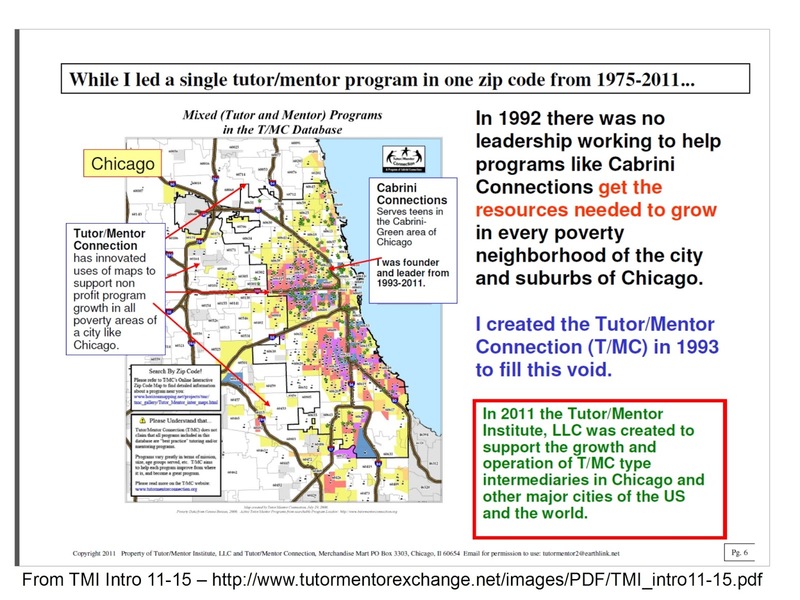 We created the Tutor/Mentor Connection, to help volunteer-based programs like the one I had led, and the new one I was forming, get the resources needed to grow in all high poverty neighborhoods of the Chicago region. All of the ideas and information on my blogs and web sites, created since 1993, focus on that goal. 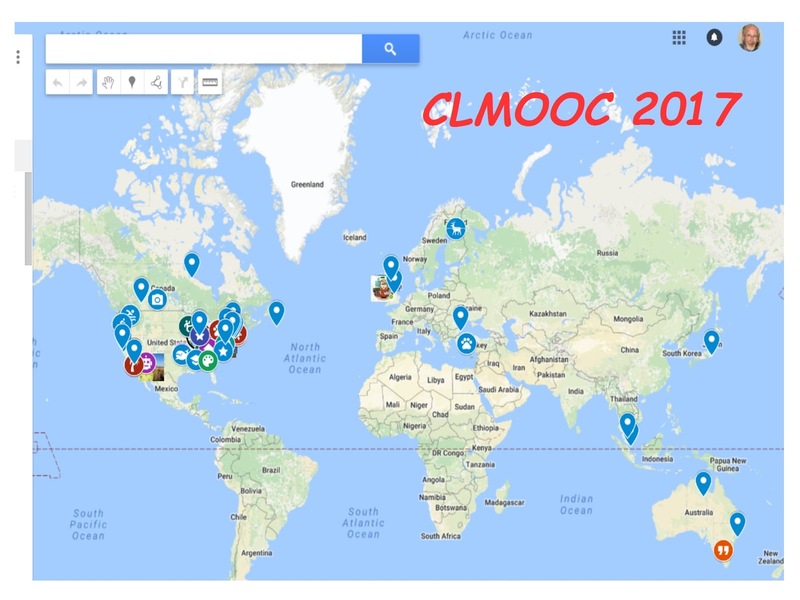 I signed up to take part in the summer 2017 Connected Learning #clmooc group activities, and added myself to their member map today. I first joined this group in 2013 and over the past four years I've developed some strong idea-sharing relationships with people from different parts of the country and the world as a result. As I wrote above, I started leading a volunteer-based tutor/mentor program in 1975 (see history) while I held a full time job with the Montgomery Ward company. 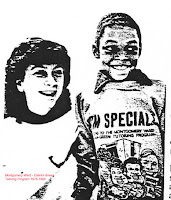 While our program grew to include over 300 pairs of youth and volunteers by 1990, funding was not an issue because all of the leaders were volunteers. 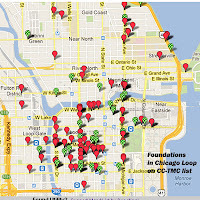 When I begin using maps I started following media stories about kids being killed in Chicago with maps showing where this was happening, and with links showing what tutor/mentor programs were operating in those areas, and what knowledge was available to community leaders, business and foundations, etc., so they would work to build programs that would provide more mentoring, tutoring and learning opportunities in more places. 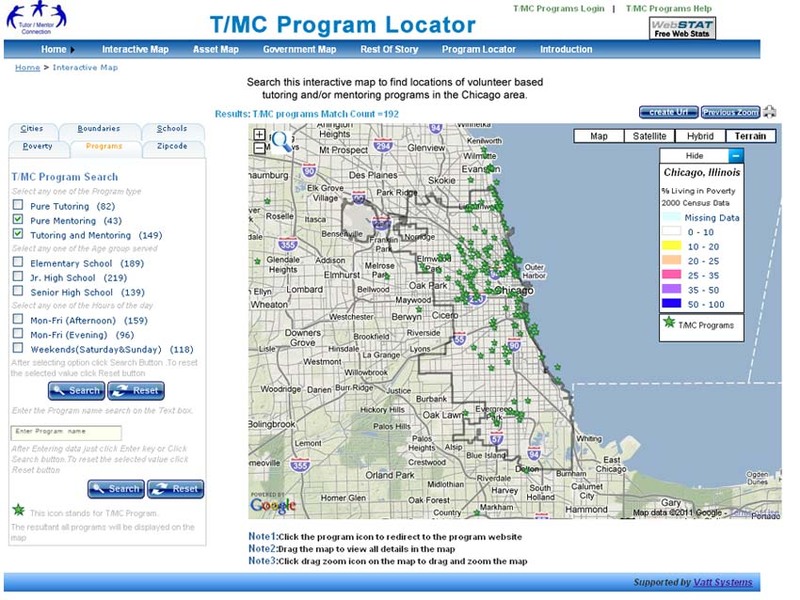 In 2008 the T/MC created a Chicago Tutor/Mentor Program Locator with maps that show where tutor/mentor programs are needed, and other maps showing banks, hospitals, universities and faith groups who are spread in different parts of the city, and who could be supporting the growth of programs in each of these areas. 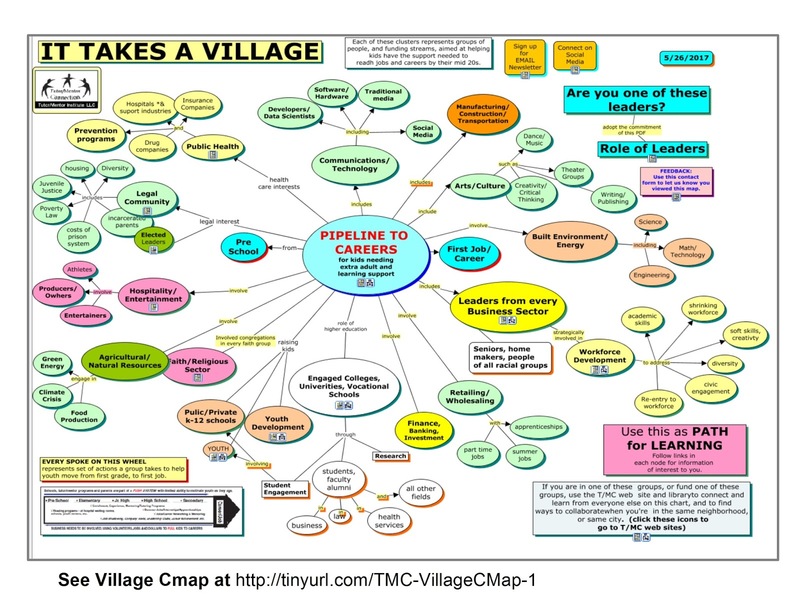 I keep asking myself, "Why haven’t leaders in these foundations use my maps, or similar directories, to adopt neighborhoods, then adopt tutor/mentor programs in those neighborhoods and make long-term commitments to help each program become the best in the world by borrowing ideas from each other and using a constant flow of operating/innovation dollars and volunteer talent to implement these ideas?" No good answers to that question. 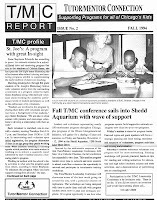 I'm no longer hosting the May and November Tutor/Mentor Leadership and Networking Conferences, due to lack of funding. However, these could be started again, or we could build an on-line conversation, similar to the CLMOOC community, if partners and sponsors stepped forward to help. 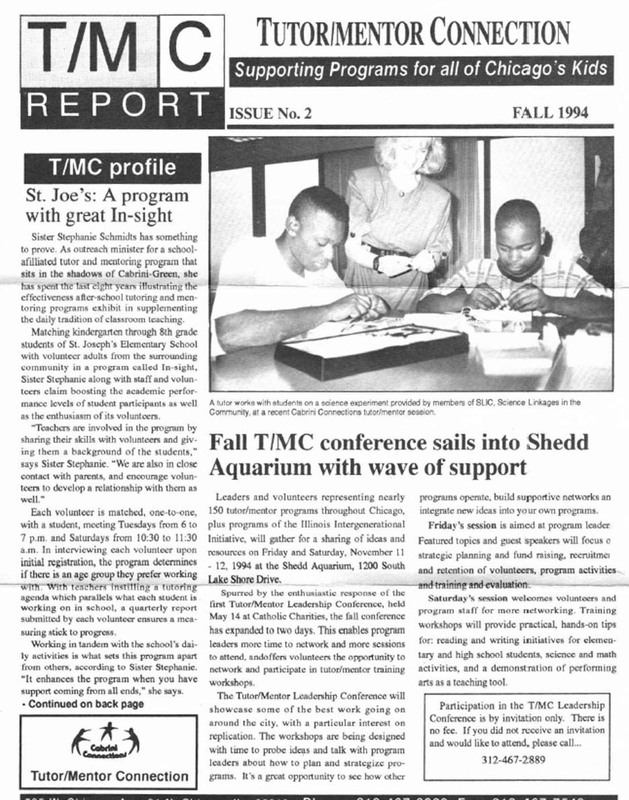 This and other articles show why I created the Tutor/Mentor Connection in 1993. 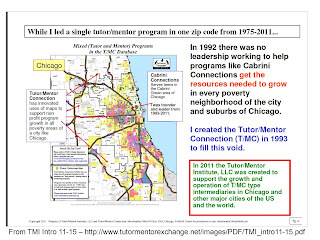 I still lead it, through the Tutor/Mentor Institute, LLC because no one else has created a similar 4-part strategy with the same aim at supporting the growth of mentor-rich non-school learning programs in all of the high poverty areas of Chicago.